It would be incredibly helpful to also see a rendering of how this affordable housing proposal looks with the proposed Facebook "Village" on the page as well. We absolutely need more affordable housing. Please, City of Menlo Park, consider this request, but make sure that when all requests come before you that you are also mindful of infrastructure, net new trips, and how we solve for the people who live here as priority #1 - not business priority first. Thanks. I agree, Menlo Park is adding high density housing and new office buildings at an unprecedented rate while ignoring the infrastructure problems that have been plaguing us residents for years. Before approving anything new and that includes Facebook's Willow Village, the City Council needs to address the current issues and the needs of the residents who already live in Menlo Park. It seems the existing council does not care about that, guess it is time to replace Keith and Ohtaki who always seem to side with Developers. Brian, electing Keith is your only hope for representation on this and related projects for the next four years. Combs will be recused from deliberation and voting on this project as well as Facebook Village. Combs was also recused from participating on Connect Menlo and the Transportation Master Plan. I'm giving up on the Traffic issue, especially if it's used as a whip to stop affordable housing. We are hamstringed from doing much as the main choked arteries are all CalTrans with other people's cars cutting through Menlo Park. We can gate-off all of Belle Haven and the Willows but I don't see folks rushing to do that. 10 years from now you won't even be allowed to drive a car without a special license as all cars will be AV's. Let the housing grow and get on your bike! Why would Combs have to recuse himself on this project, this is not a Facebook project? I understand that Combs will have to recuse himself on Facebook matters, but I see this as a better alternative than the Rubber Stamp approval that Keith gives to any developer that wants to build big in Menlo Park. With a new person from District 1 and hopefully a replacement for Ohtaki, even with Combs recusing himself reason might prevail on the council (a tie vote is a defeat). Keith and Ohtaki have done enough damage to Menlo Park, just look at the traffic over the last 8 years. Time for someone who represents the residents and not the developers. Brian, this MidPen project is right across the street from Facebook's proposed Willow Village. Sarah Staley Shenk pointed this out in the first post. Combs will be recused. Are you a lawyer? Just because the project is near Facebook does not mean that he needs to recuse himself. If that were the case Keith would have had to recuse herself from any votes related to the Willows since she lives there, obviously did not happen. His recusal from anything Facebook related is because he has a monetary involvement with Facebook being an employee. Monetary involvement is why Carlton has to recuse herself (She and her husband owned stock), though I would point out Combs was upfront about his ties to Facebook while Carlton was not and then tried to downplay it (several Almanac articles on this topic if you want to read more). Even though this project is near Facebook, they are not to my knowledge involved in the project itself so he should be able to participate in discussions and vote. As for Facebook and Facebook village I will say it again, better to have some rescue themselves and not vote that having a council member with a history of approving any and all big developments within the city and not worrying about the impact it would have on the residents, infrastructure, etc. Brian, I am not a lawyer, but I believe there is a 500 foot rule. You misunderstand the situation when you argue that, "Keith would have had to recuse herself from any votes related to the Willows since she lives there." Keith does not own the Willows, she owns a home and a plot of land in the Willows. She has been recused from items relating to O'Conner school, now called Laurel Upper Campus which is fewer than 500 feet from her property. Combs will need to be recused from discussions and voting on everything that includes or is within 500 feet of Facebook property. The MidPen project is literally right across the street from Facebook's Willows Campus. Combs will be recused. If Combs quits Facebook and sells all his stock (paying the associated taxes), he will need to wait a year before being allowed to participate. Brian, you say, "Combs was upfront about his ties to Facebook," but the literature he is distributing says nothing about his employment at Facebook, or that he has been recused from numerous items while serving as a planning commissioner. Posted by No growth candidate? Who is the zero commercial growth / zero population growth candidate for D2? Keith is proposing limits on office development? Where has she said that publicity. Isn’t it a little late given her record? Is she proposing a moratorium on the General Plan? Has Keith told the residents of Suburban Park she is advocating for the Dumbarton train to go behind their homes back and forth all day long? Facebook is actively moving forward on a Dumbarton commuter rail line. Voters from every other District won't care about trains running in Suburban Park, especially if the train provides relief from afternoon gridlock. If Suburban Park residents want the train from Stockton to stop at the Willow station, they should be reach out to Keith and rally their neighbors to vote for her. Combs will be recused from discussion and voting on this because Facebook is helping to underwrite the project. This sounds like a half truth. The office in willow village had already been up zoned in the General Plan, as has the housing. Is Keith proposing a moratorium on office development? Is she proposing rolling back the general plan? If not the half truths from trolls are misleading voters. I agree with Brian. The Keith campaign is over stating Combs recusals. The general plan is not a specific plan. Keith can push for whatever restrictions she sees fit. Combs was recused from discussion and voting on the general plan update. He was recused from Connect Menlo where these limits were set. Combs will be recused from general plan changes. If Combs is elected, District 2 will have no voice for the next four years when council votes on these projects. What we need is low-income housing - where on the pricing spectrum of low-income to affordable will rentals be? Saying Keith is proposing limits on office development is a huge laugh. In the 8 years she has been on the council they have approved every major development in Menlo Park. That includes two major Facebook buildings, Greenheart which is huge, Stanford office and residential buildings along El Camino (which won't be paying property taxes to support schools or other resources, that falls on the residents of Menlo Park), The new hotels and other major business development in the Bohannon area which includes that huge building at Marsh and 101 occupied by Facebook. So the evidence does not support anything you are claiming. I would also point out that the "20 year plan" reached its development goals in a few short years. If we stopped approving any new development tomorrow we would already be at the goal/limits set in that plan but instead they want to revise the plan. Doesn't sound like any development limits to me. I prefer to look at what she has done and not and what she "proposes" to get reelected. "Voters from every other District won't care about trains running in Suburban Park"
I don't agree with that either. The train would also cut through Belle Haven so I am sure they would care about it. The noise from that train will also carry to other nearby neighborhoods so I bet they would care. You might not be concerned with what bothers your neighbors but others are. As for your comment on Combs not disclosing his employment at Facebook on his campaign material. I went to the sites for both Comps and Keith. It is right there on the “Meet Drew” page for Combs. For Keith all I saw was a mention that she has her own law .I also found Almanac articles and articles in other local papers that all at least mention that Combs works at Facebook. Finally you seemed to be aware of it so it doesn’t look like he is hiding that fact. Finally on the matter of recusal, you are not a lawyer and neither am I so I suggest we wait until we get a definitive answer from the city attorney. However you are right about the 500 foot rule, she owns property so must recuse herself on decisions within 500 feet, but Combs does not own Facebook property. Something's rotten in MP is a registered user. Mid Pen is adding to the concentration of low-income housing in the Belle Haven. While MP needs affordable housing, I see nothing to cheer about in Mid Pen's actions. Instead, the organization should be working with Menlo Park to identify sites for low income projects in other parts of MP. It's a violation of the Fair Housing Law to concentrate low-income housing in one part of Menlo Park: Belle Haven. The facts show that 70-80 percent of all affordable housing in Menlo Park is located in Belle Haven. The Council should have questioned this concentration years ago -- instead of going along to basically perpetuate poverty. An executive from Mid-Pen is listed as a campaign contributor to Kirstin Keith. Kirstin Keith has not served the residents and small business owners of Menlo Park. I suggest voting for Drew Combs. Brian, you are very confused. Bohannon's Menlo Gateway project was approved by the voters in 2010, not the city council. Ohtaki and Keith were not even on council when that development was proposed. Keith and Ohtaki did later approve the Downtown Specific Plan, but Combs was living in Mountain View at the time and never registered to vote in Santa Clara County (according to the Daily Post). Combs was recused from Connect Menlo and the general plan update, so there is no way to evaluate his record on "major development" in Menlo Park. It is true that the train would also cut through Belle Haven, but Cecilia Taylor lives fewer that 500 feet from the train tracks, so no guarantee Belle Haven will have representation there. Finally, you declare that Combs does not own Facebook property. If he owns Facebook stock, he owns part of Facebook, and getting a paycheck from Facebook is an even bigger conflict. Maybe I am mistaken but it seems you primary goal is to attack Combs which makes me wonder who you are since you choose a non-registered anonymous account. Not sure why Combs living in a different city or if he registered to vote is relevant in any part of this discussion. Keith does have a record and it is bad, all Pro-development to the point where the impact to the residents is ignored. For example the current council refused to make the Willows Corridor part of the traffic study for the Stanford development. You say you live in the Willows, this is a concern to just about everyone I have spoken to in our neighborhood. Keith did not have a record 8 years ago either and we trusted her to look out for our best interests. I would say she failed that trust so keeping her in office would be asking for more of the same (More development, more traffic, etc.). Brian seems to think my primary goal is to attack Combs. Not true. I'm just pointing out that Drew has never been able to vote on anything related to large scale office development, and will likely be unable to vote on anything east of HWY 101. Keith has always been in-sync with the voters. We elected Keith in 2010 to get rid of the blight on El Camino Real. In 2014, Measure M was a referendum on the Downtown Specific Plan, but Measure M "died in a landslide" (as reported by the Daily Post). Had Combs been elected in 2014, he would have been recused from voting on the General Plan Update, which would have still passed with a 3-1-1 vote. Combs may be the most exciting candidate we've ever seen, but he's horrible for District 2 because so many impacts are related to Facebook. Brian, you say you are not affiliated with Drew Combs. I just checked his website, as of today, September 19, 2018, Drew Combs lists no endorsements or supporters. In the history of Menlo park politics, we have never seen a viable candidate that is unwilling to list supporters so close to the election. I checked and you will be happy to know that the City Attorney's initial take is that he does not believe Combs will have to recuse himself from this item. Since neither of us are attorneys I will have to take that as the answer we were looking for. I find it interesting that you do not state your relationship to Keith or her campaign, can we assumed you are part of her campaign, invested in it or related to her? I think her record speaks for itself. Traffic in our neighborhood has gotten ridiculously crazy and where was Keith?, voting to do another traffic study in 2 years instead of taking any actions now. It took a group of concerned residents, myself included, to go door to door gathering signatures to get the city council and Keith to take any action. I don't want to have to do that every time we, the residents of the Willows and Menlo Park, need the city council to act in our best interest. Keith is in-sync with the developers is more accurate. She votes time and again for more development while ignoring impact on Traffic. As for endorsements, you would need to take that up with Combs, as I said I am not affiliated with his campaign. I will note however that being endorsed by mayors of other cities and committee members that she helped put on those committees does not really impress me. Brain, you may have been mislead and misinformed that you'd need to gather signatures to get an item on the council agenda. You can simply write to the city council inbox. Did you try that first? A similar situation happened with the Sanctuary City ordinance. There was a Facebook post explaining that we'd need a large group of people writing in to get an item on the agenda. You can see the sample letter copied, pasted and emailed by a dozen people. What a waste of time. In the end we realized that was a total hoax, and one person could have simply contacted the mayor. Brian, you blamed Keith and Ohtaki for voting for Menlo Gateway, but they were not on council when that was approved by council. Menlo Gateway then went to the voters in 2010 where it passed by two thirds. Those are the facts. As stated previously, Keith and Ohtaki did vote on the Downtown Specific Plan, but that was challenged in 2014 with Measure M, which failed by about two thirds. If you have a problem with them voting on some specific project, you should share that here. Words out. D2 you have been way overstating Drew’s conflict. He isn’t conflicted out on this project at all. Pretty sad Kirsten supporters have to resort to making up stories about conflicts because her record is so bad she can’t run on it alone. "The new hotels and other major business development in the Bohannon area which includes that huge building at Marsh and 101 occupied by Facebook. So the evidence does not support anything you are claiming." Brian uses the word "evidence" to describe something that is easily proven false. The Menlo Park voters approved Menlo Gateway (Web Link) the same day they elected Keith and Ohtaki (Web Link) for the first time. D2 who are way misleading people. It’s a two prong test. 500 feet plus it has to be material effect. There is no material effect to FB greater than than the whole community whether or not mid pen gets more affordable housing at that location. Brian did his homework. Also Kirsten Keith was on the Planning Commission and definitely approved the Gateway project before it went to the ballot. Stop with all the half truths. Keith should try running on her record rather than pretending she is something she isn’t. You should try defending that record rather than making up things about Combs. Talk is cheap, especially in this forum, but I've provided links to facts. D2 you have provided links to half truths. You know full well Keith was on the Planning Commission and approved the Gateway Project. You also know full well Keith has approved every requested upzoning for Development in Belle Haven whether for Facebook or any other developer during her time on City Council. Her only response is she was on the negotiating committee for some of those developments. So she got to hobnob with the.developers before she voted to approve. Just look at her developer related donations. Stop trying to make Keith out to be what she isn’t. Defend her record rather than play pretend and attack Combs asserting pretend conflicts that wouldn’t let him be what Keith never was. Stop misleading people whether Combs would be conflicted on the development. It’s a two prong test. 500 feet plus it has to be material effect. There is no material effect to FB greater than than the whole community whether or not mid pen gets more affordable housing at that location. Brian did his homework. Stop with all the half truths. Representation for D2 has not responded to my comments about his affiliation with the Keith Campaign so I would say it is safe to assume they are either part of her campaign, related to Keith or Keith herself hiding under an anonymous name. "Brain, you may have been mislead and misinformed that you'd need to gather signatures to get an item on the council agenda." That may be true but you know what action you get from the current council by doing that? Nothing. At best you might get they to say something about including a study of the issue or in the case of Willow traffic saying they would have another traffic study done in 2 years. That was not good enough for those of us impacted by the huge traffic issues that resulted from the 101/Willow Road project (Which Keith voted to approve). We could not get in or out of our drive ways, cars parked on the street were being hit, drivers were honking and yelling at each other, one even brandished a gun at another driver. What it took to get action on these was hundreds of signatures on a petition and a large number of us showing up for a council meeting and speaking. Maybe you have an "in" with the council and can get things done by writing an email but with this City Council it does not work like that for the residents of this district. WE need to fix that with new council members. I agree with the posts above, Everyone should look at her record and believe that if she is re-elected we will get another 4 years of the same (pro-developer and pro-traffic) that we have had for the last 8 years. The discussion made me decide to go through the 2010 Planning Commission minutes. Kirstin Keith was a member of the MP Planning Commission in 2010. On May 3, she voted AYE (along with Commissioners Riggs, Ferrick and O’Malley) to send the Gateway project proposal on to Council (189). Web Link The transcripts contain details that concern me. I’ve concluded that the public’s interests would be served by having an outside auditor conduct a performance review of MP’s largest 3-5 deals over the last 10 years. It’s time for an objective look at the facts by an outside auditor skilled at this type of performance analysis. The purpose would be to identify ways to improve the outcomes for the MP residents and small business owners. The MP negotiating team consisted of McClure and then then City Manager (McIntyre arrived in 2012), Kent Stephans and Justin Murphy. Commissioner Riggs (he was serving then too) asked William McClure about the negotiating team's experience with large deals. In response, McClure assured him that "between the City Manager and myself, we've probably done -- and people in my office, we have probably done fifteen development agreements in the last twenty years, some much larger than this, some smaller“(59). McClure’s statement was taken at face value. However, length of time doing something doesn’t necessarily equate to expertise. The transcripts make it clear that the (then) City Council was pushing the project. McClure asserts that Council “has played an active role in being involved in the project’s overall timeline … and the City Council has made the review of this project a priority” (51). Knowing that Council wanted the project to move forward could be considered a form of pressure to agree with what Council wanted. The Chair thanks three commissioners for their service and notes that at the (next day) May 4, 2010 City Council meeting, “there’s also the possibility that Commissioner Riggs and Commissioner O’Malley will not be reappointed to this Commission” and it might be their last night together as a Commission (31). You can see Council’s vote here Web Link We also need a way to protect our commissioners from political pressure. They need a way to remain independent and to not feel pressure to go along with staff or council pressure. Unfortunately, multiple MP Commissions and Committees are set up as advisory in name only. The staff sets the agenda and determines what will be discussed. Their role description might also not serve residents' interests. This needs to change. 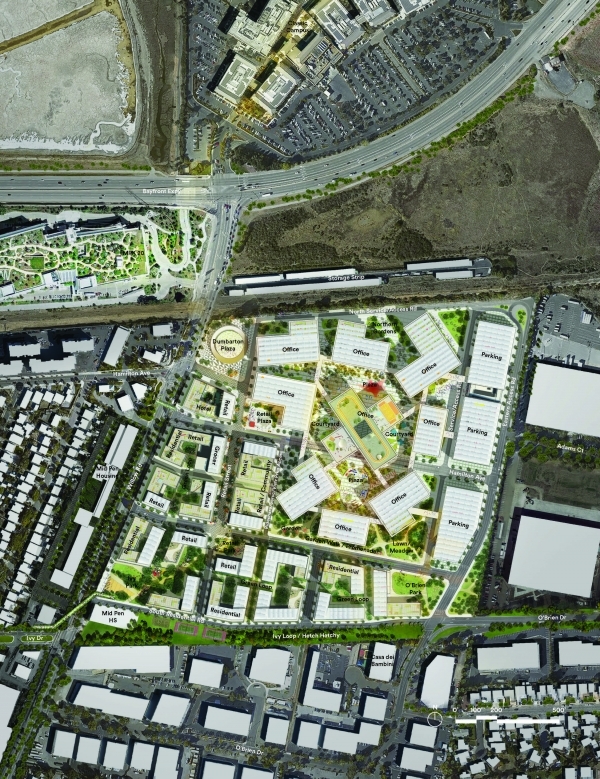 Fergusson, Robinson, Cline and Boyle voted to put Menlo Gateway on the ballot. I don't know how Keith voted while on the planning commission, but I did find this flier from the "No on T" campaign. This flier, from "Measured Growth for Menlo Park" urges residents to vote against Menlo Gateway. The "smoking gun" in this piece is two "hard hitting" questions about the development from planning commissioner Keith (Web Link). Apparently, Keith was the only planning commissioner asking hard questions of developers. Measured growth, read the May 3, 2010 Planning Commission transcript or go directly to the page reference that I provided in my prior post. Keith voted in favor of the Gateway development project. I see no evidence, at all, in the transcripts that she asked "hard questions"of the developer. Kirsten Keith is great at asking tough questions. She is trained criminal defense lawyer. She asks the tough obvious questions first. Then she reframes the issue to mitigate the bad answer. Then she always votes for the project and says she addressed the tough question. She did the same thing with the General Plan. She asked all sorts of tough questions about traffic. The she said it will all be okay when the Transportations Master Plan is finished, and when Dimbarton Rail is finished. Only it still isn’t finished two years later, and by all accounts is a total mess, and the person in charge of it just quit working for the City. And cut through traffic is bad and getting worse. And Willow Road is a parking lot. But Kirsten asked the tough questions...and then voted for development as always. That’s her MO. She did the same thing on the Planning Commission with Gateway. She was one of the votes that sent it to Council, as Lynne has researched. Why are her supporters trying to disown that? Why can’t they own her record and defend it? That’s what is most unnerving and why many former supporters have deserted her. They have grown wise to these games. She recently did the same thing when council considered the minimum wage. She made a speech she was sympathetic, but then mitigated the issue and tried to get the City attorney to say he didn’t have time to do it. But he wouldn’t say that. So then she found shelter in city staff saying they didn’t have time for just one public meeting. Then she moved on. But she asked the tough questions first! Everyone should watch that meeting. It was so transparently obvious she just didn’t want to do it. Don’t be fooled by her rhetoric. She has a record. Look at her votes. Her walkers are doing the same thing now. They are saying she won’t approve any new commercial development. That’s misleading. It’s all been approved in upzoning she already voted for in the General Plan. Is she saying she is going to roll that back? Of course not. It’s a half truth. Don’t be fooled by the spin rhetoric. Look at her record. Why can’t her supporters just own it and defend it? Mueller didn't vote for the general plan update, but he did take the same developer money. Keith listed a donation from Tarlton from before the filing period. I received a flier from her with information about all of her contributors, very transparent of her. Something people don't realize is that Mueller listed the same donation, but after his election was over (Web Link). We have no way to know if Combs will be transparent like Keith or tricky like Mueller. We'll have to wait (until after the election) to know for sure. Just another distraction randomly and nonsensically bringing up Mueller. Keith has a voting record. Stop trying to make Keith out to be what she isn’t. Defend her record on development. rather than playing pretend. Stop misleading people with half truths. Mueller's voting record is proof that political contributions don't equate to voting a certain way. I don't have a problem with Mueller reported union and developer financial contributions two months after his election. Mueller is not running for re-election this year, Keith is. Let's keep on track. I think that your arguments have been clearly shown to be half truths, Keith did vote for the Gateway project. She is pro-developer ad the expense of the residents who live in the city. She only acted on Willows Traffic issues when pressured by overwhelming neighborhood support for action. Is this really who we want for another 4 years (though it is not sure she would be around for 4 years if another, higher, office opened in the next election)? he has a record and as much as her supporters want to obfuscate it it is there for everyone to look at. As someone reading this conversation for the first time let me just add my two cents and say the focus on Councilmember Mueller is really weird and a turnoff. The focus should be on the candidates, their records, their vision, and how they would address problems in the neighborhoods. Kelly, this story is not about the candidates, but Brian wanted to make these comments about the election. Brian wrote, "guess it is time to replace Keith and Ohtaki who always seem to side with Developers." Keith recently voted against a Stanford office development (along with Mueller and Calrton) effectively killing it, but this doesn't fit with Brian's view, so he's calling this "half truths." Mueller is part of the conversation because he's very involved in the Willows. If Combs is elected, we'll need to rely on Mueller to represent the Willows regarding development impacts and related traffic issues in the bay shore area. An official has a disqualifying interest and must recuse from participating in making a decision if it is reasonably foreseeable that the decision will have a material effect on one or more of the official's financial interests. Receipt of income from FB is a financial interest, so if it is foreseeable that a decision will have a material effect on FB or on property owned or leased by FB (and if there is no exception) then Drew would have to recuse. So the two primary factors that one has to examine for any decision are foreseeability and materiality. Any application by FB or a FB controlled entity for land use permits or entitlements for land owned or leased by FB would have a foreseeable and material effect on FB and therefor would require recusal. Similarly, an application by a property for property leased by FB would have a foreseeable and material effect and therefore would require recusal. In addition to applications by FB or applications involving FB owned or leased properties, the following may meet both tests - certain general plan/Connect Menlo updates/amendments that affect the amount of commercial development allowed in the Bayfront area or otherwise have an financial impact on property owned or leased by FB; there could be some conflict issues around some of the discussion of the Master Transportation Plan, in particular regarding improvements in and around the Bayfront Area that might have to be funded by development within the Bayfront Area in which FB is the largest property owner; consideration of projects that are contiguous to Willow Village or other properties owned or leased by FB - more likely to have a conflict if it is a commercial project that could be using some of the remaining development potential in the Bayfront Area, etc. ; and possibly improvements to Bayfront Expressway, Willow Road east of 101, and Dumbarton Rail Corridor improvements/studies - there will have to be a factual analysis/determination of what the effects could be to FB, whether they would be required to fund large portions of the cost, etc. to determine materiality.